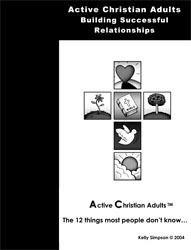 Active Christian Adults is 12 units, each with A and B sessions. It includes topics ranging from communication skills, conflict resolution, emotion management making budgets, wise choices in friends and dating, recognizing personal strengths and future planning. Sessions include experiential activities. . It is written from a Christian lens and includes Biblical references that support key concepts. – Authored by Kelly Simpson, MA, LMFT with Amanda Weatherby-Stimmel, PhD (Fuller Theological Seminary) and Ben Stimmel, MA LMFT (Fuller Theological Seminary). It is a companion program to ARYA-C for Christian youth.